Nice score. Glad to see another 4kq. As for swaps, Id go 10vt all the way if you were going to use standalone. If not, then 20vt. Check the wiring in the drivers front door jam. This is where I found broken wires keeping the trunk from locking/unlocking with the key. Hey Dan!!! Thanks for the kind words. I'll likely talk it up with people at Carlisle about swaps and such, so if you are there, we will discuss. I'm gonna test the vac pump in the trunk to see if its working then go from there. I bet there is something amiss behind the drivers door panel. Been really cold here lately, and add in being busy at work that leaves me not making time to work on the car. Luckily I got more "snoozer" parts this week. I can finally hopefully button up the pass front door now that I have a new lock rod. Got a new OEM headlight switch plug, which I'll keep around once the one in there now gives up the ghost. Hopefully I'll have a fuel sender en route too. I'll hopefully have more updates and photos once things thaw out a bit here. You really don't mess around, great progress! A jalopy shitbox that goes fast but nothing works is still a beater. It got up to 30 yesterday so I spent some short time in the garage. I got some of the small bumpers for the trunk installed, which were a bit of a pain. Got the new pass front lock rod (latch to handle) installed. The old one was pretty rusty and took some persuasion to remove. There may still be a slight issue with locking the pass front door. I'll look into a bit more but it seems that the door doesnt properly lock. I ran out of time so I couldnt investigate further. I did let the car run for a while. Honestly it runs better than my 90 does (which needs a new idle switch). Lastly I tossed the beat up red leather back seat into the attic and drug out the nicer set that came with the car. I also found my original CE door panels from my white car. I'll be cleaning these up with leather clearner and see how things pan out. I'll have red leather waiting for me at Carlisle, so it may not be terribly important that these get super clean, but I love detailing. Aside from a screw driver and a hammer, might you guys have a smarter way to remove the fuel sender? The factory tool is nifty but I cant figure out a way to unscrew this thing. The fwd sender is easier since you can insert a long screwdriver and just turn. I hope spring is here to stay. Let the car run for a bit tonight and actually moved it out of the garage for a bit. Still waiting on some parts but I should be able to work on things again now that the weather is nicer. I did use some leather cleaner on the spare and nicer rear seat. There is still some staining so I may try a better product. I also found some spare door panels from my old 4kq that will likely make their way onto a few of the doors. Start sanding Mike. You know you want to paint your own car! Nice mike! So, should we expect to see this at Carlisle? Speaking of that, is anything getting set up this year? Opted to work on the 4kq after work tonight and I'm glad I did. I took advice from others and used my test light at the pump connector in the trunk. When locking the LED lit up, but not when I tried to unlock. Hmmmmm. I already had the door panel off. Wiring around the connector looked good, so I popped off the accordion boot at the door jamb, and voila, my broken wire! I was lucky enough to solder a good piece of wire from there to almost all the way to the connector. Before I buttoned everything up I tested it and it actually works. The *bonus* is that it fixed my trunk opening issue without using the key! Only thing now is that the pump runs a bit longer than it should, but there appears to be a leak at the trunk actuator. I'll investigate more to see if its the actuator or vac tubing. Just glad the locks work now. I'm at the point where I can button up both front door panels since everything up there works. I'll toss on some cleaner rear panels this weekend. Yeah, I'll start up a Carlisle thread here shortly . The 4kq probably wont be there. I still gotta sort out the title and I'd want to drive it daily for a bit before I trust it on a long haul. The 90 will probably end up making the trip. Took some time yesterday to redo the lighting in my small garage. This is the first step in getting this place more suitable for car work. I'm going to add one more fixture which will go above my work bench (which hasnt been built yet). I'll also be painting the walls. Once thats done I get get some organization going on and get down to business. The lighting is so much better and well worth a few hours of my time! Mike, I love the color combo on this, and I don't care if it doesn't go fast along as there are plenty of pictures of the restoration I've said before, I like a restoration thread just as much as I like a go fast one. I vote 20vt. Why? Becuase I agree with Dana that they're better in nearly every way and just as cheap. Parts are also probably more available too. Then again, I can see you wanting the originality of a 10v. Things are leaning more towards 20vt at this point. Nathan dropped by last week and we chatted about engine options. 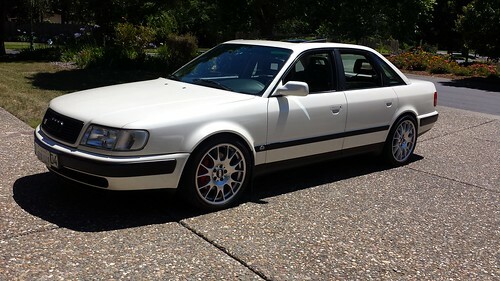 I could easily make the car very daily driver friendly with a factory engine management system and a few RS2 goodies. For the time being thats where things will head in that department. The world needs more 20vt swapped b2s! - Fixed the vac leak at the trunk lock actuator (no more hissing and longer running pump = happy Mike). - Removed Clifford alarm system. This wasnt too bad, just time consuming. Anyone need it? - There was some interesting wiring at the headlight switch area. One wire led to the alarm harness, so I cleaned that up. I do have a brand new headlight switch socket that I'll utilize at some point. For now, the original one is fine. - Replaced the turn signal switch since the cruise button was br0ked. I guess I have been away from these cars too long because I installed the switch wrong (so it wasnt engaging the high beams). Took me 30 minutes to figure this out. - Buttoned up the instrument cluster area and ensured all the switches work. Hazard took a bit of time to sort out, but it works great now. - Installed a new OEM battery hold down clamp since the car didnt come with one. Upon installing I noticed the bolt holding the grounds to the battery tray was really loose. That would explain some random no starts. Got a minty sunroof switch panel installed. To my surprise the sunroof actually works quite nice. Bonus. Ended up pulling up the rain tray to find a forest full of pine needles and such. Vacuumed that all out and am almost done cleaning the area. While I was in there I noticed all the washer fluid line had deteriorated. Luckily I had a nice stash of line and ran that. A few adjustments of the nozzles and things work pretty good, minus the wipers themselves. I gotta either lube up the mechanism underneath or replace it. Drivers arm no longer wants to move. Not much else to do until I get some good used parts. I figure once everything is fixed with the interior I'll concentrate on the engine bay. Nice work Mike. Good job bringing it back. I say bring it to Carlisle! chaloux wrote: Nice work Mike. Good job bringing it back. I say bring it to Carlisle! That would be a prime deal. Still sorting out some issues with the title, unfortunately. I am hoping to get that taken care of soon. If it gets sorted out by May and I can drive the car around a bit there is a slim chance I could bring it. Been a while, so its time for a small update. I was finally able to get the title issues sorted out with the car and have registered and insured it. This means I got to actually drive it. First time its been out of my housing addition since I brought it home off the trailer in January. I havnt touched anything in the engine bay or suspension, but the car is very healthy and drives great. I almost have the interior somewhat respectable. Doing some swapping of red leather seat components this week. I still have the original seats from my old 4ktq and will be utilizing the passenger side seat back in place of the one thats in the car now. I'd LOVE to find more red leather seat goodies, so if anyone has any, I am your man. I got all the interior lights working, switches included. The only thing outstanding is the LCD display on the radio. I'll be running XM, so it doesnt matter too much. Lastly I checked to see if the AC would work. There are some nice gouges in the condenser, which would explain why it wouldnt hold any refrigerant. Hopefully I can find one. Glad you are back at it Mike. I was beginning to wonder what happened to this. Thanks guys. Yeah, the whole title debacle put things at a standstill. I didnt have much motivation to touch the car, but now that I CAN drive it, I'm doing more work. I just wish some parts werent NLA or impossible to find, but I guess thats part of the fun, eh? Hoping to get the seats all squared away this weekend. XM car kit came today, so I can put the rear seat back in once I run the antenna wire. Well, not sure why I did this tonight, but I got the front seats out and stuff all swapped around, plus I got the XM installed. Oddly enough the toughest part was putting the rear seat bottom back in. The back seat bottom has some nice cracks, plus the leather is pretty dry. If anyone knows of some good red leather stuff let me know. Its tough to find, but at least I'm getting the word out.